In order to be found by other scholars and considered legitimate, your journal should be discoverable and visible. Journal indexing is an excellent way to increase discoverability, allowing you to achieve higher rates of readership and citation. Indexing enables your journal to reach a wider audience and become a part of trusted academic databases used frequently by researchers in all disciplines. Once your journal is indexed in a database, important metadata about your publication (and sometimes the full text of your journal’s articles) will be available (and searchable) by all of the database’s users. Additionally, as potential authors assess the visibility and impact of your journal, they’ll find that it is widely indexed and discoverable by audiences they are trying to reach. 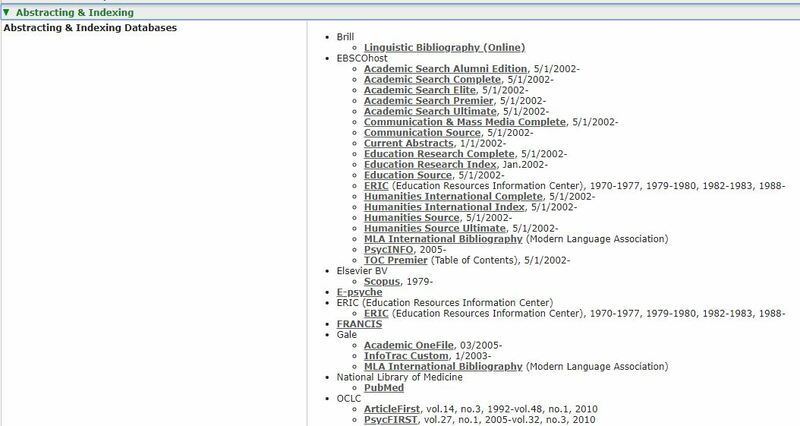 For example, below is a screenshot of indexing coverage from Ulrichs, a database with information about journals and other serials. Ulrichs is a common tool promoted for faculty and graduate students looking for publication venues. How do you go about getting indexed by these databases and/ or directories? We have provided a step-by-step Guide to Applying for Journal Indexing to help you through this process! The guide includes a list of highly used databases that new journals should consider being indexed in. , These include UlrichsWeb, EBSCO, and ProQuest. For each database, we list a quick summary of the database’s scope, the basic set of requirements necessary to be indexed, and links to the necessary forms to start the index application process. Our department also provides in-depth assistance for journals in our program interested in being indexed in the Directory of Open Access Journals (DOAJ). DOAJ is an online directory that indexes open access, peer-reviewed journals, and is considered to be one of the best indicators of high quality for open access content. Authors often go to DOAJ to confirm that an open access publication is not predatory, for example. The Journal Application Form for indexing within DOAJ is detailed , but we have compiled a template that will help you answer each of these questions. Our DOAJ Application Template walks editors through each question, providing default answers for questions that apply to all IU Open Journals, as well as locations for questions you may not be sure about. If you have any concerns or questions about indexing your journal, contact us at iusw@indiana.edu. We’re happy to meet one-on-one with editorial teams interested in indexing! Indiana University Libraries are pleased to announce that we have joined ORCID – a nonprofit organization that provides an open, transparent solution for researcher identity management. IU faculty, staff, and students can use ORCID to create an ORCID iD – a 16-digit number that uniquely identifies a researcher. This iD is then linked to an individual’s research output. With the help of ORCID iDs, IU faculty and staff can more easily receive credit and recognition for their work, reduce time spent on reporting and administrative requirements, and continually and automatically update their dossiers by incorporating services such as CrossRef and DataCite. An ORCID iD helps you easily and reliably link your unique identity with your contributions. You can maintain all of your key information in one place, and you control your own privacy settings. ORCID allows you to link with other identifier systems, including those maintained by funders and publishers, and exchange data freely with those research information systems. For example, authors can often log in to journal submission systems using their ORCID iDs, sparing them from continually re-entering affiliation and contact information. Furthermore, when an article is subsequently published, a citation and link automatically appear in that author’s ORCID profile, enabling easy access to other publications for interested readers. Registration is free and fast for IU researchers and scholars. ORCID is integrated with IU CAS Login, which enables users to utilize their IU login information to automatically create an account affiliated with Indiana University. 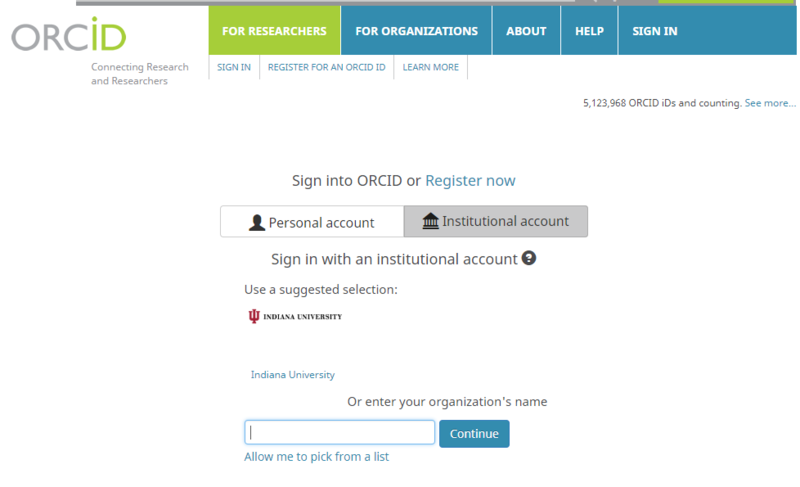 When you Sign Up for your free ORCID iD, select “Institutional account” in order to login with your IU credentials. If you have any questions about creating or using an ORCID iD, please contact us at iusw@indiana.edu. Video training modules: Starting with some of our most frequently asked questions, we will be creating short explanatory modules that can be watched individually or linked together to create a training program for a system, concept, or policy. Open Scholarship expansion: Our website, openscholarship.indiana.edu will be undergoing some changes to better reflect the work we are doing and provide some more content for our patrons. You can expect a new and improved workflow for depositing data into IUScholarWorks as well as information on creating and adopting Open Educational Resources. Crossref Cited-by: We are exploring the possibility of participating in the Cited-by service, which would enable authors and readers who use our journal programs to discover who is citing the articles we publish. Journal metrics: This summer we are working on a plan to share journal usage data with editorial teams. We hope to have a plan and template in place by September so that we can launch the service in fall. This post is the first in the “Open Access Policy Guide” series. This series will address components of the IU Bloomington Open Access Policy and its implementation. We have written other posts about passing the policy, leveraging the license (Part I & Part II), and resources to support it. The IU Bloomington Open Access Policy is an opt-out policy. This means that if faculty do not wish to make a version of their published article openly available, they must opt out of the policy. When a faculty member opts out of the policy, a waiver letter signed by the Vice Provost for Faculty and Academic Affairs is generated. This letter waives the university’s license for your article. The Scholarly Communication Department is working to make it as easy as possible to opt out of the policy and generate a waiver letter. Are you a faculty member who needs to opt out of published articles? There are two methods you can use to opt out. In IU’s annual reporting system – Digital Measures Activity Insight – faculty will see a new option in the Publications/Scholarship of Discovery category. This option is “Opt out of the open access policy for this article (IUPUI & IUB only).” To opt out of the policy for an article, simply click this box. A waiver letter will be generated and emailed to you. This is the best opt-out method if you need a waiver letter instantly and prefer not to wait for us to email you one. In IUScholarWorks Open (our repository extension to support the policy which will be launched shortly), complete the ‘Opt-out’ submission form. Enter your name, article title, and journal name (ISSN and DOI are recommended but optional). Select submit, and a waiver letter will be automatically generated for download. You will also receive an email with the waiver letter as an attachment. If you opt out using this method, you are not required to check the box in method one – we will track your waivers and ensure that it applies when you complete your annual report. Do I need to opt out for every article I have ever published? No. The policy only applies to articles published after it was passed on February 21, 2017. What if I forget to opt out for an article but realize later that I need a waiver? The policy states that you are able to change the archival status of an article at your discretion. Please contact us to make this change and generate a waiver letter. What if I co-author a paper with another IU Bloomington faculty member and one of us opts out in DMAI but the other does not? I want to opt out for all of my articles, how do I do that? According to the policy, “Upon express direction by the Faculty member, the Office of the Vice Provost for Faculty and Academic Affairs, or his or her designate will waive application of the policy for a particular article.” This means that faculty members must opt out for each article published after February 21, 2017. The fastest way to achieve this is by clicking the opt out button for each article when you are completing your annual report. My publisher says that I need to apply an embargo (make an article unavailable for a predetermined amount of time) – does this mean I need to opt out? How do I make it available when the embargo has elapsed? You do not need to opt out for an article that requires an embargo period before it can be made openly available. The IUScholarWorks Open repository will restrict the article and automatically release it after the designated amount of time has passed. I have more questions – where can I find help? We have an FAQ for the policy available on our website that provides helpful answers to a range of policy questions. We are also available by email at iusw @ indiana . edu and will soon be announcing drop-in sessions to answer questions about the policy. Grant proposal season is upon us. Increasingly, writing a grant proposal also means writing a data management plan that details how data will be managed, preserved, and shared after a funded project ends. The Scholarly Communication Department offers a Data Management Planning service and works directly with PIs, grant writers, and administrators to create plans that align with funder requirements. Why are data management plans required? In February of 2013, the White House Office of Science and Technology Policy released a memo entitled “Increasing Access to the Results of Federally Funded Scientific Research.” This memo mandated that all federal agencies with over $100 million in annual conduct of research and development expenditures develop a plan for public access to research output. Data management plans, previously required only in some circumstances by some federal agencies, became widespread. By October 2016, all federal agencies meeting these criteria had implemented public access policies. These public access policies hinge on the precept that research funded by taxpayer dollars should be made available to the public, industry, and research community. Why can’t I preserve data with my funding agency? The 2013 OSTP memo was an unfunded mandate. This contributed to a landscape of distributed solutions provided by many stakeholders in academic research. Commercial publishers, universities, non profits, and government data centers all worked to support researchers working to comply with new data sharing guidelines. In some cases, individual directorates/divisions will provide or endorse a data repository, for example the Arctic Data Center for NSF-funded science on the Arctic, or GenBank, the NIH genetic sequence database. In other cases, researchers are expected to use their discretion in selecting an appropriate data sharing solution. Where do I find data management plan requirements? 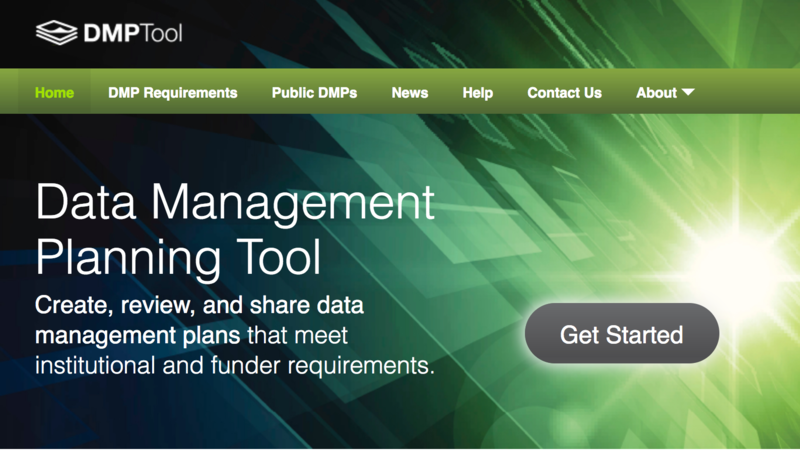 Indiana University is a member of the DMPTool, a tool that walks users through creating, reviewing, and sharing a data management plan. The tool has pre-fabricated templates for each directorate/division across funding organizations. To browse requirements for a specific funder, navigate to the DMP Requirements section and search for or select a funder from the list provided. To create a data management plan using one of these templates, log in to the tool using IU credentials and select the relevant funder from the list provided. How do I choose a repository for my data? This question is best answered on a case-by-case basis, but there are general guidelines that researchers can use to make the best choice. If in doubt, get in touch. If there is a widely-used disciplinary repository in your domain, consider choosing that repository. If you aren’t sure, check author guidelines for the top three journals in your field. Do they all recommend the same repository for sharing data? Alternately, take a look at www.re3data.org/ to see a registry of disciplinary repositories. 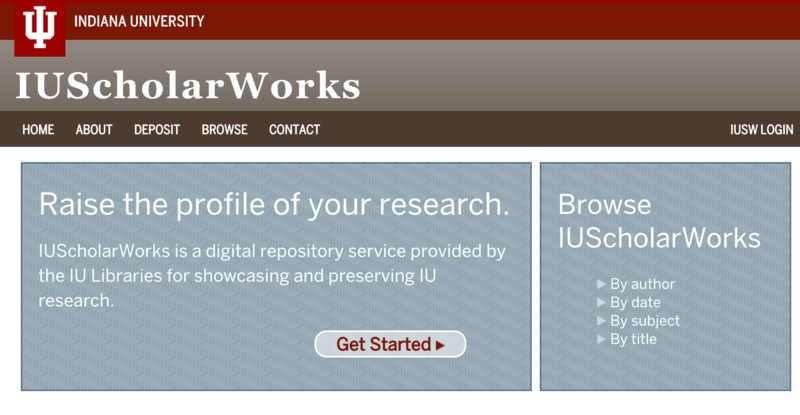 If you have no appropriate disciplinary repository, would rather not pay fees to deposit data, or prefer to keep your data with your institution, consider Indiana University’s institutional repository IUScholarWorks. It is completely free, operated by the Libraries, and designed to support funder requirements. I want to use IUScholarWorks to preserve and share my data. What do I say in my plan? To increase access to the published research that has been funded, the researchers will deposit peer-reviewed or pre-print manuscripts (with linked supporting data where possible) in the IU ScholarWorks institutional repository. A DOI will be created for the data and used in all publications to facilitate discovery. These data will be preserved according to the current digital preservation standards in place for content within the IU’s institutional repository infrastructure. This includes a duplicate copy within the IU Scholarly Data Archive (SDA) and eventual deposit into the Digital Preservation Network preservation platform. The combination of these systems provides mirroring, redundancy, media migration, access control, file integrity validation, embargoes, and other security-based services that ensure the data are appropriately archived for the life of the project and beyond. I have a lot of data – can I still put it in IUScholarWorks? Yes. In almost all cases, we are able to to provide free data archiving to IU-affiliated researchers through our partnership with the UITS Scholarly Data Archive. Large datasets live in the Scholarly Data Archive and are made accessible through IUScholarWorks by way of a persistent URL. Here is an example of a weather dataset published in IUScholarWorks. Pro tip: You can drop off your dataset in the departmental staging area and send us an email with contextual information – we’ll do the heavy lifting and make sure it gets into IUScholarWorks. Who can help me with my data management plan? We can. Contact iuswdata@indiana.edu for assistance creating or implementing a data management plan. The Scholarly Communication Department can help to connect PIs with free campus-supported services to preserve and share data. The Scholarly Communication Department recently launched a new Open Scholarship website. The site serves as a central hub for researchers interested in open access, open data, and/or open publishing. The site is particularly useful for finding information about how faculty can comply with the recently-approved IUB Open Access Policy. The Open Access Policy will provide a mechanism for faculty to assert their rights as authors, enabling them to share their scholarship more widely and increasing readership and engagement of IU-faculty work. The launch of our open scholarship site begs the question, “what is open scholarship?” More pointedly, what qualifies as “scholarship” and how “open” does that output need to be? We think that our site presents a definite answer. We believe that the term scholarship should be inclusive of all of the ways that scholars communicate: through journal articles and books but also through sharing their research data, making visible their learning objects and teaching materials, and even creating new and innovative publications to fill a distinct gap in a body of literature. The new site illustrates that we as the Scholarly Communication Department support scholarship in all of its modes and formats, formal and informal. Similarly, while open is a core value and essential principle of our work, we recognize that there is an entire spectrum of openness. The Scholarly Publishing and Academic Resources Coalition (SPARC) and the Public Library of Science (PLoS) recently collaboratively authored a “How Open Is It?” spectrum, which helps illustrate this point. They break open down to reader rights, reuse rights, copyrights, author posting rights, automatic posting, and machine readability. For each, they note the spectrum of open to closed that can exist, which illustrates just how complex and contextual open is. For example, there might be an “open” article that is accessible to readers, but the author wasn’t able to retain all rights to the article and it isn’t in a format that is machine readable. Or, alternatively, an author might retain their copyright and make their work their open but only with strict and limited reuse permissions. The Scholarly Communication Department’s goal is to support all manifestations of openness, regardless of where researchers fall on this spectrum. Our new website showcases the many services and resources our department offers to facilitate open scholarship. In addition to managing IUScholarWorks and providing faculty a space to make their work open, we provide one-on-one consultations to researchers interested in a variety of topics including advocating for their author rights, evaluating their impact, crafting a data management plan, or starting or making open a journal. We work collaboratively with other library and campus units, including the Indiana University Press, Digital Collections Services, and UITS, to assist researchers with digital scholarship, publishing ventures, and data storage. We look forward to continuing to enhance and develop our suite of services to better support the IU research community. The Scholarly Communication Department would like to thank the Discovery and User Experience Department, specifically Matt Fitzwater and Courtney McDonald, for their assistance and expertise throughout the development of this site. The way Open Access journals publishing is done on campus is about to become even more rewarding—and exciting. Select OA journals based at Indiana University will have the option of benefitting from enhanced publishing services through the Office of Scholarly Publishing (OSP). The OSP was established by Indiana University Provost Lauren Robel in 2012 as a single-service campus publishing resource that draws upon the expertise and capabilities of IU Libraries and IU Press. 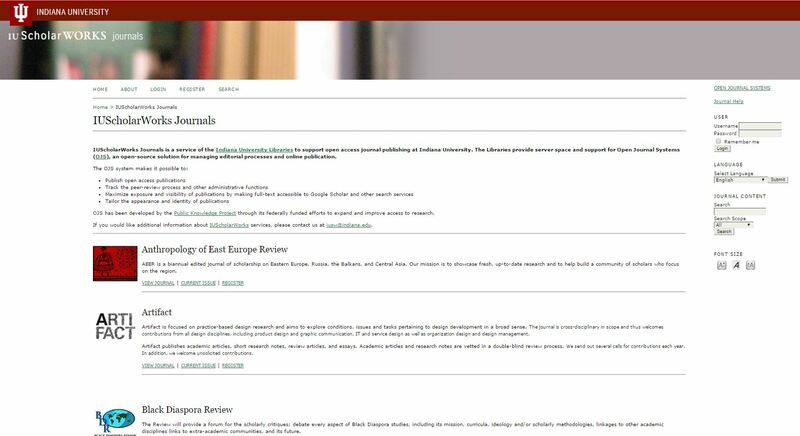 Since 2009, the IU Libraries have facilitated the publishing of open access journals with the IUScholarWorks journals service. Among other services, the Libraries have provided technical support, performed platform maintenance and upgrades, and migrated content into the Public Knowledge Project’s Open Journal Systems platform at no charge. Now, through the Office of Scholarly Publishing, those services can expand, still at no charge, for those campus OA journals whose operations are consistent with professionally-published scholarly journals. Drawing upon IU Press expertise in production, copyediting, indexing, and marketing, the OA journals selected will have the option of receiving an array of expanded publishing services. These include worldwide promotion alongside IU Press scholarly journals; copyediting, design, and layout; indexing; print-on-demand and fulfillment; e-reader editions; and additional revenue through print and online advertising sales. Representatives from IU Libraries and IU Press have begun meeting with journal editors to determine how the expanded services of the Office of Scholarly Publishing would be able to help support their particular areas of need. This expanded-service journals program is the first phase of the rollout of the Office of Scholarly Publishing’s comprehensive suite of publishing services for the IU community. In the coming months, those services will continue to grow, including the development of new websites from IU Press and the OSP that will contain robust, interactive author interfaces as well as a host of vital information and publishing options for campus authors and editors. The Scholars Commons is located on the first floor of the East Tower at the Herman B Wells Library. These are drop-in hours, so no appointment is necessary. Journal publishers are increasingly using XML to improve the discoverability and long-term accessibility of their content. At IUB Libraries, the Digital Collection Services and Scholarly Communication departments have helped two open access journals, Indiana Magazine of History and The Medieval Review, establish and maintain XML workflows. Recently, we migrated one of these journals (and are in the process of migrating the other) to our Open Journal Systems (OJS) platform and have been using the XML galley plugin to streamline the XML publishing process. My colleague Nick Homenda and I presented on these efforts last week as part of the Digital Library Brown Bag Series. A recording of the presentation is available here: http://hdl.handle.net/2022/19773. If you edit an open access journal at IUB and are interested in integrating XML into your workflows, please contact us – we’d love to work with you!